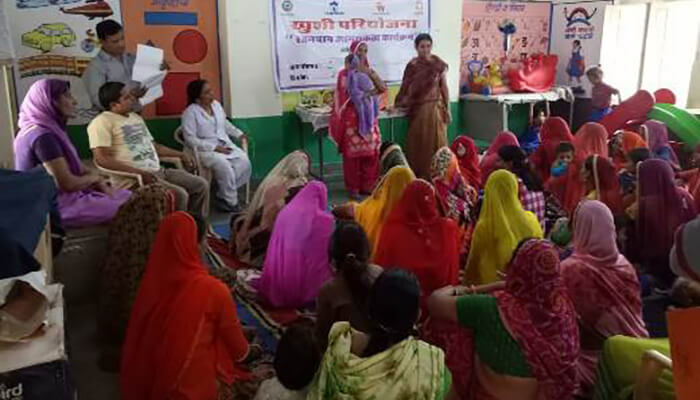 To enable the project participants and their communities to adopt healthy breastfeeding practices and reject harmful feeding habits, a breastfeeding awareness programme was organised. With a total of 20 events, 113 beneficiaries participated in the events in Hurda, Shahpura and Suwana blocks of Bhilwara. ICDS officials inaugurated the events by welcoming the women and community members and sharing the advantages of breastfeeding with them. A small short film ‘Amaji kehti h’ on exclusive breastfeeding and new born baby care was shown to the participants. Three lactating mothers who practiced exclusive breastfeeding to their child were felicitated. A quiz was organised to enhance general awareness amongst participants and gifts were given to them for answering correctly.